In every office, there is someone who is prone to losing their pen. That person could be you! It’s annoying when it’s a standard Biro from a multi-pack but when it’s a special pen, it can be expensive too. 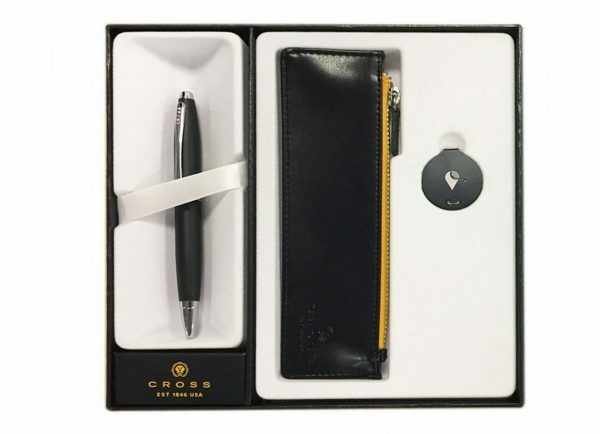 Cross have now teamed up with TrackR and introduced a gift set with their stylish art-deco inspired Cross Calais ballpoint pen and a classic black pouch incorporating a TrackR device, which we recently featured here on OxGadgets. The device pairs with your smartphone using the TrackR app ensuring you never lose your pen again – so long as it is with your pouch that is. This could become an essential addition to your stationery collection whether you’re a student, writer or let’s be honest, someone who needs a quality pen which is most people. 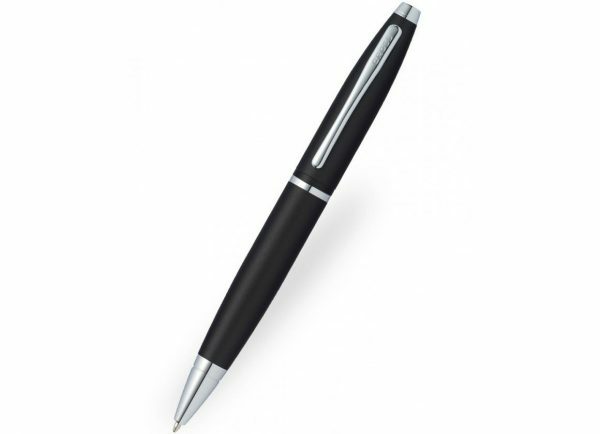 The pen itself is sleek and stylish. It is 135mm long and 12.5mm in diameter. It comes in matte black or satin silver with a lustrous chrome trim. 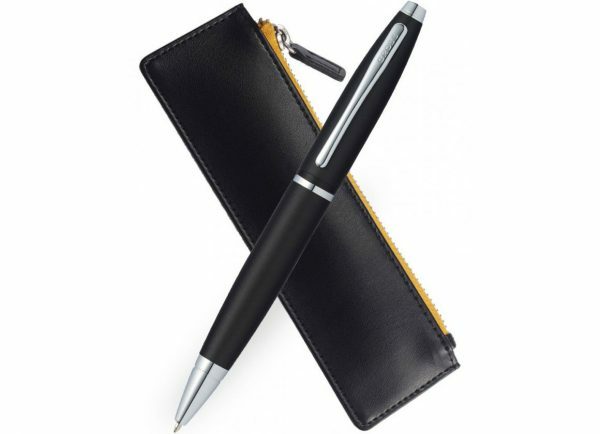 It comes in black ink and uses a twist mechanism. Ink refills can be easily purchased from stationers. 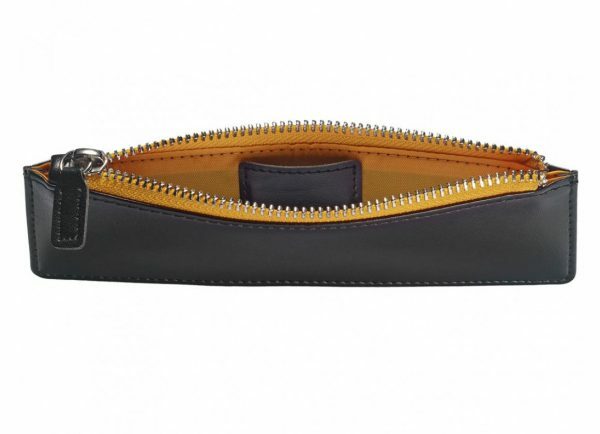 The pouch is black with a yellow trim around the zip area and has an integrated smaller pouch to hold the TrackR disc. It’s large enough to hold two or three similar sized pens, but not much more. It has a leathery appearance so teamed with the Cross Calais pen, it really feels like you have a classy piece of stationery. I tried the matte black pen and found it easy to hold and gave good grip. Pairing the TrackR disc with your smartphone is pretty simple. I downloaded the app to my iPhone and I understand it is also available for Android phones. The app requires you to start an account with TrackR which takes around five minutes to do and you have to answer all the standard questions to create a username and set up a password. It asks you to pair with the TrackR disc using a Bluetooth connection and there were no problems locating it. It then asks you to name the item your TrackR is attached to. TrackR promise that there are so many users on their system that even if you are out of range of the item, you can still find it when someone else walks past it. The information is sent to their central network and you can then find it. I was dubious because I live in a rural area but when I first created my account there were 388 Crowd Locate users in my area. It’s a good figure and obviously the higher the number of users in the area, the better chance there is of finding a lost item. I would imagine that in an urban area that figure would be even higher. Then came the big test. Could I find the pen pouch using the app after my husband had hidden it? Yes, I could. The app shows a map so you can see roughly where the TrackR device is. It also shows a little scale of how close you are and give you “getting closer” or “getting farther” hints. Finally, you can press a button on the app to transmit a beep from the TrackR making it easier to find. The beep is quite subtle on my own TrackR but it’s so distinctive. There is no mistaking the disc’s noise. What I really liked is how if I can’t find my phone, I can press a small button on the TrackR to call my phone and make it ring, even when it’s on silent. However, you need to keep your Bluetooth settings discoverable for this and participation in the Crowd Locate community to work. This is a beautiful, elegant pen and I love the pouch. I really like the TrackR disc in the pouch. I think it’s an innovative addition and a really great way to utilise this technology, especially with such a high-quality pen that you really don’t want to risk losing. To read more or purchase this pen, visit here. It is priced at £49.99.